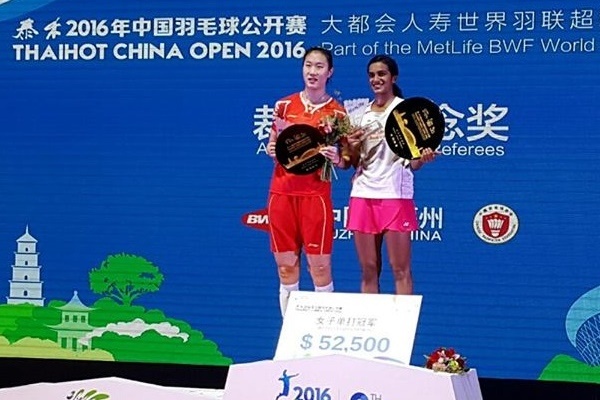 Olympic silver medallist P V Sindhu clinched her maiden Super Series Premier title after edging out Sun Yu of China in the finals of the USD 700,000 China Open badminton tournament in Fuzhou on 20th November 2016. Sindhu, who became the toast of the country after becoming the first Indian women to win a silver at Rio Games, continued her rampaging run as she lifted the prestigious title after beating Sun 21-11 17-21 21-11 in the summit clash that lasted an hour and nine minutes. World No. 11 Sindhu had come into the match with a 2-3 head-to-head record but then statistics counted little when she took the court at the Haixia Olympic Sports Center. Sindhu dished out a dominating game as she zoomed to a healthy 11-5 lead early on. The Indian looked sharp and athletic as she engaged in a fast-paced game to bamboozle her opponent. Saina Nehwal had clinched the China Open in 2014 before finishing runners-up last year. Sindhu had reached her maiden Super Series final at the Denmark Open last year but the title eluded her then as she lost in straight games to 2012 Olympic champion China's Li Xuerei.